When you begin to search for scholarships, what’s the first thing you read? If you said the eligibility requirements, you’re right! This information is crucial because if you aren’t eligible to apply, your application is headed directly into the trash can. You’ll have wasted the time and effort it took to complete the application and send in your supporting documents. Nobody has time to waste, especially if you absolutely need scholarship money in order to attend college. However, you also need to read and understand what the scholarship is funding. Some scholarships can only be applied to tuition while others are only for books and supplies. Many scholarships are awarded to the student for just one year and others are “renewable” which means you can reapply for the scholarship again after you’ve won it. Some scholarships are even renewable for all four years of your undergrad degree. Those are the real gold mines. You’ll also want to understand how and when the scholarship money is disbursed. Is it sent directly to the college? Will you receive a check then pay the college yourself? Is the money sent at the beginning of the school year as one lump sum? Or will it be sent at the beginning of each semester? If it’s sent at the start of the semester, are there requirements you need to meet in order for the money to be sent for the second semester? Some scholarships will require you to maintain a certain grade point average (GPA) and others may require you to complete a progress statement by a certain deadline. Miss either of these and your second payment won’t be sent and you’ll be left scrambling for money you counted on. This can mean you might have to take out student loans or drop out of college altogether. Neither is a good alternative. If you’re lucky or good enough to be offered an athletic scholarship, make sure you understand the ramifications if you become injured. Is there a clause in your scholarship that states if you’re injured and cannot return to the sport you’ll lose your scholarship funding? Are there restrictions for the number of games missed? Are there academic requirements such as a certain GPA must be maintained in order for you to continue to receive your athletic scholarship? For many students on sport scholarships this may be a deal breaker when it comes to completing their college education. There are other “scholarships” that should rightly be called unpaid student internships. Here’s a good example of what I mean and why it’s so important to read the fine print (i.e., all of the information about the scholarship provided on the sponsoring organization’s website). If you read the requirements of the Emerging Voices Scholarships, you’ll discover that you’ll be doing a lot of writing and that you are required to attend their special luncheon at your own expense. If you’ve ever been to New York City, you know everything there costs more (hotels, taxis, food) and, if you live far away, you’ll have to pay your own airfare. Even if you live nearby, you’ll still be paying for your own travel costs. They offer $2,000 in scholarship money, for which you may well end up spending the bulk of the award JUST to attend their luncheon. Plus, you’ll be working to create content on a topic of their choice to be used on their website. Does this sound like a scholarship opportunity? Not to me. It sounds like good publicity for the sponsoring organization along with free content development. If you’re a reader of this blog or our scholarship books, you already know we’re strong advocates for funding your college education with scholarship dollars NOT student loan debt. We encourage and support you to go after as many scholarships as possible. 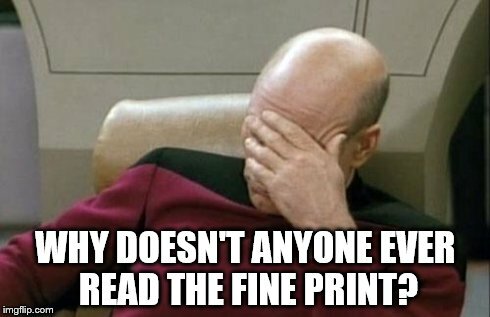 Having said that, we also want you to read the fine print so you won’t be caught off guard and lose the funding you need to graduate debt-free. Do you have a scholarship story to share?